I’ve had a couple of people ask me how they can prepare for LWP Hack Night, so I thought I’d just give a quick introduction to the set of modules. 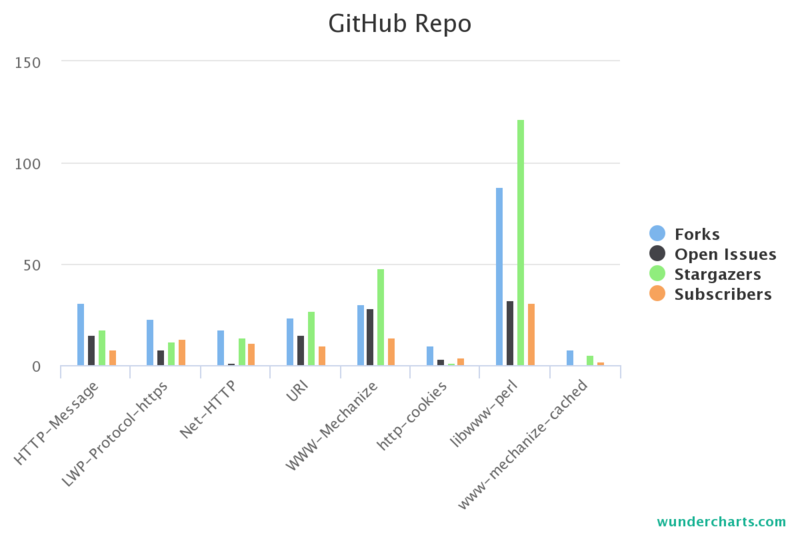 I whipped up a graph of the various GitHub repositories to give you an idea of which are the most popular and which have the most open issues. Those stats seem to roughly correspond. 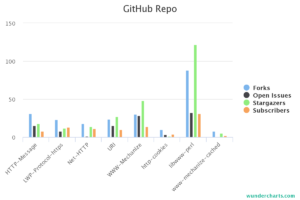 If you want to poke around the repositories on GitHub, that will give you an idea of where you can start. How you might like to go about this is entirely up to you. If you have time before the meeting to identify some bugs which you may like to approach or comment on, please feel free to get started now. When we’re at the meeting, we can work out a plan to divide and conquer. There’s more than enough work to go around. We won’t (and can’t) clear this all up in one evening, but the point here is to make incremental improvements and learn something useful in the process. Please feel free to get in touch with me in advance if you have any questions about this. The best way to do this would be via the Toronto Perl Mongers email list. In an earlier post, I introduced you to LWP::ConsoleLogger. I’ve been using it heavily since then, but one thing I didn’t tackle was how to debug a user agent you can’t easily get it. Some modules don’t provide a public API which allows you to access their user agent. Or, maybe the user agent which you want to debug is so far removed from your code that you can’t easily access its public API. Previously, this was not an easy problem to solve. However, this is no longer the case. simbabque was kind enough to write LWP::ConsoleLogger::Everywhere. It’s quite simple to use. Simply add this line to your code and run it. Any objects of the LWP::UserAgent family should now dump extensive logging information to your terminal. It can get a bit fancier than that, but this is really all you need to know in order to get started debugging 3rd party LWP::UserAgent-based HTTP requests.